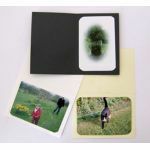 These cards have four semi-circular slits cut into them so a 6x4" photograph can be mounted. The card measures 178x128mm. Please make sure of your choice because these are made to order and cannot be returned. Minimum quantity for "Colorplan 270gsm Photomount Cards" is 20. Minimum quantity for "Boutique, Cocktail, Majestic, Precious Pearl, Sirio & Stardream Photomount Cards" is 20. Minimum quantity for "Recycled Kraft Photomount Cards" is 20. Minimum quantity for "Olin Smooth 300gsm Absolute White Photomount Cards" is 20. Minimum quantity for "Irridescent Conqueror & Curious Photomount Cards" is 20.